Tommy Flowers is at the forefront of presenting Bass Music to New Zealand. Via his music label Nuff Said Recordings and a weekly radio show of the same name on George FM, Tommy delivers a constant supply of dub plates unreleased tunes alongside a deep historical knowledge of underground dance music & culture. A British expat but now a warmly adopted Kiwi, Tommy Flowers brings his wealth of street knowledge from the birth of bass culture in the UK and blends it with equally rich bass culture of his new homeland New Zealand. 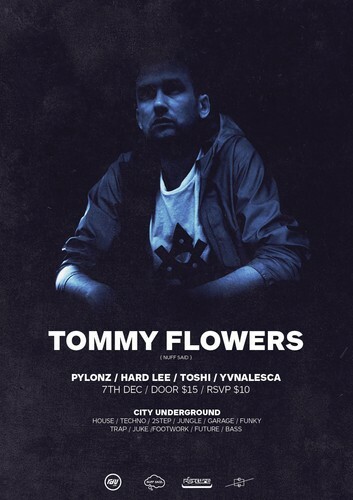 Highly in demand on the Auckland club scene, City Underground is very excited to host Tommy Flowers in Christchurch for an exclusive warehouse show. “Bass” is an emerging new class of dance floor music. Loosely defined and identified by the use of bass frequency as the dominant component of track composition some commentators are referring to this development as post-dubstep. Regardless of the semantics of genre; producers, DJ’s & audiences are embracing this fresh direction in electronic music for is savvy use of dance music knowledge and history mixed with cutting edge rhythm & production techniques. Electronic music is prone to stagnating itself through the overt commercialisation and mindless iterations of popular trends and hype in the scene. Its also know for forming strong division between genre and style. Bass music equally abandons and explores these classical divisions by sourcing, samples and integrating elements from all tempos and styles of dance music. Casually creating new hybrid genres, blatantly breaking rules or wantonly reinterpreting stylistic clichés. The result is a wonderful blurring and confusing of lines between; underground and commercial; old school and contemporary. By breaking rules, ignoring conventions and literally abandoning the defines of genre “Bass Music” is escaping the classic traps of dance music and injecting a long anticipated feeling of freshness for the future of dance floors.